Cordial is not a regular feature in our house, but as a treat at a birthday party, or mixed with sparkling water as a non alcoholic drink, it’s pretty special to have your own home made, and home grown option! We had abundant lemongrass this year, so we have made a huge batch of Thai curry paste, propagated more for next year and shared loads with our community but we still had more left – we decided to go with some deliciously fragrant cordial! Grate the ginger and cut and bruise your lemongrass. Turn heat down to a gentle boil for 10 minutes (decrease to 90C). Remove from heat but allow to sit for a further 30 minutes – 1 hour to steep and cool, before sieving the solids from the liquid. Pour the liquid into a sterilised glass container and use as you would any cordial. This one is particularly delightful with lots of ice and a few mint leaves on a hot summer day! Will last a couple of months in the fridge. Fruit based desserts are my favourite! I love chocolate and sweets as much as the next person but there is something about the amazing natural sweetness and huge variety in fruit which makes it such a delight… And when you can pick the fruit from your own backyard it is so much the sweeter! Mix together all dry ingredients and stir through melted butter until well combined. Tip into a medium hot frying pan, and toast, stirring regularly, until golden brown and crunchy. Then remove from the heat. ‘hedhehog’ your mango cheeks by scoring deeply in a grid pattern, down to the skin, but not through. Hold the edges of the mango and push up in the middle to pop up the squares. Sprinkle each with 1/4tsp of coconut sugar. Place mango under a hot grill. Watch it carefully! Allow the sugar to melt and start to caramelize. This only takes a few minutes. Remove from oven, top with crumble mix and serve with a dollop of natural yoghurt. My big boy has been having a tough time lately. So when we have an afternoon at home (which is rare!) he is pretty keen to spend one on one time with me. Pre-teens often don’t want to sit and talk in a formal, eye contact kind of way … so cooking and working along side each other provides a really good opportunity to talk and try to sort somethings through. So we adapted our regular choc chip cookies and came up with these beauties. Form a teaspoon full into a ball and spoon onto a lined baking tray, allowing space to spread. Press down gently. Cook in a preheated moderate oven for 14-15 minutes. They will be soft when you remove them from the oven. Allow to cool on the tray for 10 minutes before transferring to a wire rack to cool completely. They will be crunchy on the outside and chewy on the inside. I don’t remember any family from my childhood that didn’t have Tupperware icy pole moulds! There are loads of different moulds you can buy now, but whichever you choose to use, they are fabulous for making simple, healthy, tasty, waste free desserts. This recipe is very flexible. Make it more or less creamy depending on the amount of yoghurt you use. It’ll be less ice creamy and more of an icy pole if you leave out the banana and switch to other fruit. In our freezer we had a heap of mango left over from a self picking expedition where we went slightly (*understatement!) overboard! And then we had 2 bunches of our homegrown bananas ripen very quickly so we’d peeled and frozen them too. So when we were after dessert these were a no-brainer! Put everything in a high powdered blender/bullet/thermo machine and blitz until very smooth. If you’re using a thermo machine, make sure you drop frozen chunks of fruit through the top on to already spinning blades. Start at Speed 4 and then work up to 8 for a smooth finish. Pour into your moulds. This quantity fills 12 of the Tupperware moulds pictured. Stick in the freezer for 4 hours, or until frozen. We share supper in the evening after church each Sunday. This week it was my turn on roster. I always try to make sure that I cater for as many food allergies and intolerances as I can so that, at least sometimes, those who might otherwise be left out can join in. This recipe was a hit – free from gluten, eggs, dairy, nuts, soy, legumes and also vegan… but delicious enough that the non-food allergy folk enjoyed it and several requested the recipe. Winner! 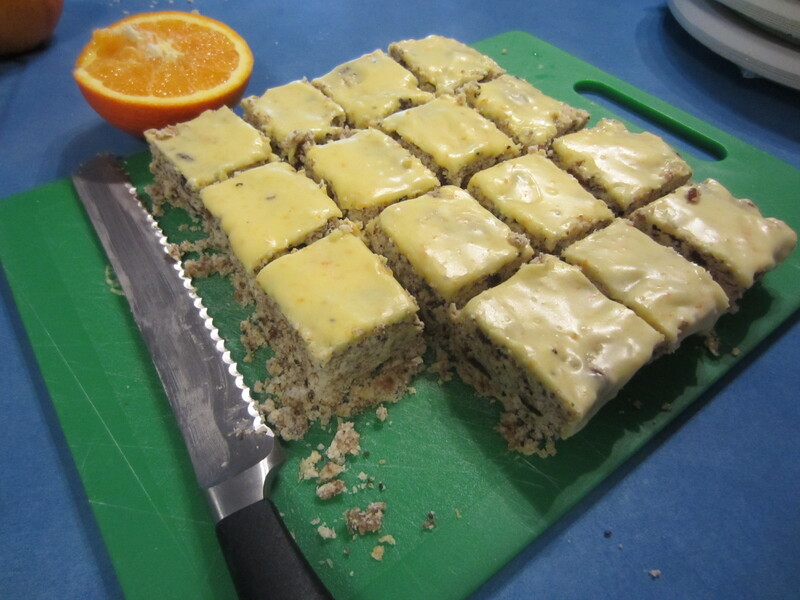 Weetbix slice was a childhood favourite – a regular feature in our school lunchboxes. I’m sure the slice came about as a budget-stretching way of using up the inevitable crumbs at the end of the pack! 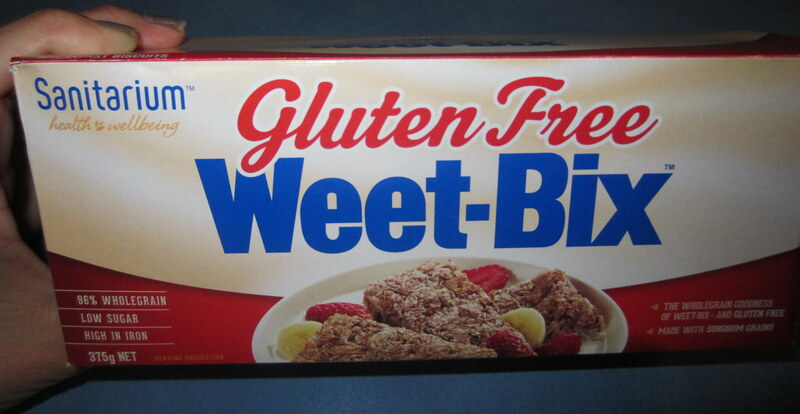 The gluten free version of Weetbix is made with sorghum and although I’m not the biggest fan of the original as such a nutritious cereal, it fits our allergy requirements, my kids are excited and I’m pleased to be able to use them in baking! Mix together all dry ingredients (Sp 4, 8 seconds). Pour the wet mix into the dry mix and fold together until well combined (Sp 3, 15 secs). Press firmly into a lined baking tray (mine was 20x20cm). Bake in a preheated 180C oven for 25 minutes. All to cool and then ice with maple icing – made with 1 tbsp soft vegan butter beaten into 2 tsp of maple syrup, a pinch of cinnamon and several tbsp of pure icing sugar (add more as required to reach your desired consistency). Slice and store in airtight container in the fridge. Makes 16-20 slices. P.S. I’ve had a query about replacing the banana … simply switch it out for about 1/3 of a cup of apple sauce … add a teaspoon more at a time if the mixture seems too dry. Mmmmmm granola. Fabulous crunchy texture that adds interest to breakfast. It is so versatile and you can really load it up with great stuff to boost your fats and protein – nutrients that are missing from most store bought cereals! I do make a yummy crunchy granola (that you can find here) but I was after an even quicker and more simple granola that I could make in bulk and have on standby in the pantry for everyday breakfast (or dessert!). I am conscious that it is really easy to eat sweet granola, so for another option, I am using cinnamon here instead of a sweetener (although there is an option to add more sweetness if you are so inclined!). Cinnamon is so light and fragrant that it works well to give the perception of sweetness without the sugar. I make this one in a double batch, but the ingredients listed below are for just a smaller single batch. 1 cup mixed seeds (or nuts if you like) – I love a mixture of pumpkin, sunflower, flax and hemp seeds. Sprinkle with cinnamon then mix well to evenly coat. Drizzle over oil and mix well to evenly coated. If you’re adding honey or maple syrup, drizzle it over here, together with the oil – it helps to spread further if it is warmed first. Allow to cool completely before storing in an airtight container. **To make this one coeliac friendly, use a mixture of puffed rice and shredded coconut, in whichever ratio you like best. For grain free use a mixture of buckwheat groats and coconut flakes. Throw it in your yoghurt, eat it with milk or with some stewed fruit – my favourite is with yoghurt and a few berries! I love the combination of crunchy nuts and seeds and the sweet, chewiness of dried fruit. Add in some whole grains and just a touch of dark chocolate and it really is a winning combination! These are a delicious and satisfying morning tea or afternoon snack. A note on the dried fruit – always try to opt for the fruit that is naturally dried instead of being preserved with sulphites – it’ll be a darker colour, but it is a better option for those who are sensitive to those additives. You can usually find them in a health food shop or in a bulk buying store. And before you get too worried about the sugar content of 1.5 cups of dried fruit – remember it is split over 24 cookies …. 1.5/24 = 0.0685 cups of dried fruit. It’s not a massive quantity and it’s still a good source of fibre that comes packaged together with the sweetness! *obviously you need to use nuts and seeds that are safe for your diet. When we make these nut free we use a mix of pumpkin, sunflower, hemp, chia and flax seeds. When we eat these at home we use them as an opportunity to get in the nuts that we have now passed food challenges for and need to consume weekly (macadamia, walnut, brazil and hazelnut). Mix and match to find your favourites! Place the apples and cranberries in your food processor or thermal cooker and pulse multiple times, until finely chopped. Add in the nuts and seeds and pulse multiple times until they are roughly chopped. Now add in your flour, baking powder, orange zest and cinnamon and process until evenly combined (speed 4, 10 secs). Continue processing (speed 4) whilst you add in the melted butter and egg (or substitute) through the top chute. Mix until evenly combined and the mix turns to a rough dough. Stir through your choc chips now if using. Take heaped teaspoons of the mix, and form into balls before pressing on to a lined baking tray. Bake in a preheated moderate oven for about 15 minutes, or until golden. Cookies will be soft when removed from the oven. Leave them in the tray for 10 minutes before transferring to a wire rack to finish cooling. Makes about 24 and keeps well in an airtight container for a week. Watch out for the cookie monster while they are cooling!